SUPERCHARGER COMPATABLE TO OVER 400 BHP !!!!!!!! 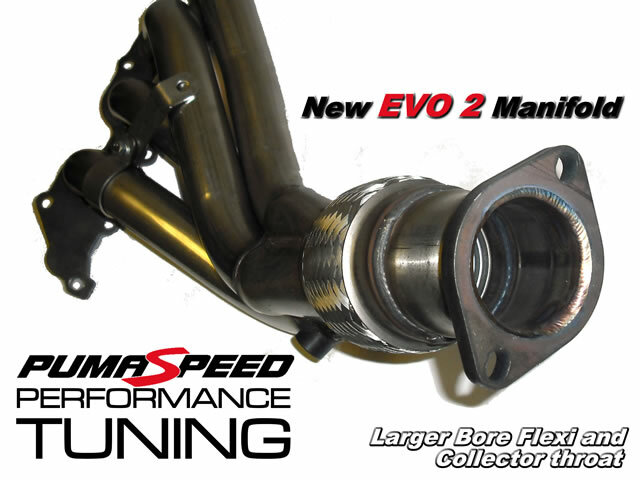 The NEW EVO 2 Manifold from Pumaspeed features an enhanced flow collector and flexi pipe that has shown results of over 400 bhp on Supercharger equipped vehicles. Its in stock and ready to ship. Not wanting to sit back and rest on the fact that Pumaspeed have helped tune over 2000 Fiesta ST150 since its launch in 2005, the team took another look at the still massivley popular Milltek Sport 4-1 EVO 1 design. Using the same technology used in their 400bhp Supercharger exhaust the design team could see a very simple and effective way of adding extra flow and therefore power into all Fiesta ST. Testing was conducted back to back on the same car on the same day. The EVO 2 Manifold made 3.5 bhp more afer 4500revs all the way to the top revs at 6900. Also an additional 7nm of torque was available from 3150 revs when fitted in conjunction with the Milltek Cat Back and Sport Catalyst and the Pumaspeed 182 remapping. Its all in the primary pipe specification.The correct length and diameter of the primary pipework makes all the difference, Pumaspeed asked Milltek to use the same size very special oversized primary pipes from th EVO1 4-1 manifold but with a much better collector entry angle and longer collector length improved the flow with an virtual increase in the primary length. Universal fit - any exhaust / Standard Cat, Sports Cat ,Decat standard ford or performance aftermarket, YES TEY ALL FIT !! The Pumaspeed Workshop team are ready to fit the Ford Fiesta ST 150 EVO 2 Manifold by Milltek Sport in our Head Office located here. Therefore making parts and labour a total cost £480.00 (inc. VAT). Pumaspeed have a specialist distribution team that can dispatch the Ford Fiesta ST 150 EVO 2 Manifold by Milltek Sport to any destination worldwide.